WHAT IS AVERSIVE TRAINING? And why you should stop using it. In this article I will explain what is aversive training. Not familiar with aversive training? Think again as you have heard of it but under a totally different name! For the purpose of this article, I first want to define 'aversive'. Causing avoidance of a thing, situation, or behaviour by using an unplesant or punishing stimulus, as in techniques of behaviour modification. A trainer using aversive training will discourage undesired behaviour by adding an aversive stimulus (Positive Punishment) and will encourage desired behaviours by removing an aversive stimulus (Negative Reinforcement). 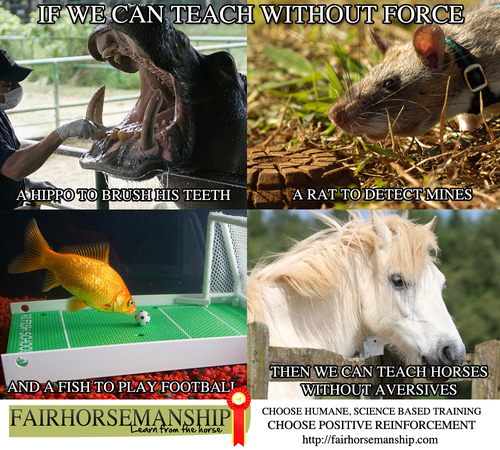 So if the trainer using such method wants the horse to perform a specific behaviour he will use something unpleasant enough to cause the horse to want to avoid it. This method is marketed to horse owner under the euphemistic term "pressure/release". In addition, the removal of the aversive stimulus is often wrongly described as a "reward" by the trainer. This is incorrect as nothing pleasant is being added. One thing many horse owners want is their horse to enjoy learning. If you are one of them, then it should be no brainer what's left for you to do. Another thing most owners want is to establish strong bonds between them and their horses. The primary function of forming bonds is protection. So how can we expect horses to form a strong bond with humans that they associate with aversives events and stimulus that make them feel unsafe?